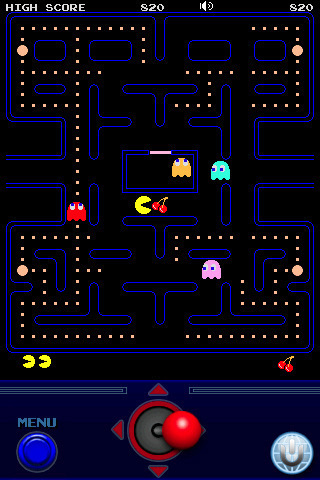 Namco Games has come to your rescue and brought along their most successful arcade game ever, PAC-MAN for your iPhone or iPod touch. PAC-MAN Lite is the free version of the two offerings from Namco. The gameplay uses the classic joystick to move around and gobble up the old blinking Power Pellets and munch on various fruity snacks. How many quarters did you spend on the old arcade game back in the day? This version of the game is sold in the App Store for $7.99 which is about half a roll of quarters. There is also a free version of this game. To control your moves in 3 different ways: 1) using a soft joystick on the bottom of the screen. 2) using swipe method, you can swipe your fingers on the iPhone to indicate where you want PAC-MAN to go. 3) Using the built in accelerometer you can just tilt you iPhone or iPod touch and move around the game board that way (we think this is the most intuitive method). Complete with the soundtrack audio and the retro 80’s look and feel graphics, this is one iPhone game to snap up right away. So forget all the 3D Xbox, PS3 hype and check out this classic blast from the past. AppSafari review of PAC-MAN for iPhone was written by Joe Seifi on February 7th, 2008 and categorized under Action, App Store, Featured, Fun, Games. Page viewed 12372 times, 1 so far today. Need help on using these apps? Please read the Help Page. Can you change them please? My name is Olivia and I handle online marketing for my client site. As an ongoing process to increase the link popularity for my client’s site, I am looking for some good quality inbound links. I have visited your site through search engine and would like to propose a link exchange deal with your site. I am sure this exchange would be beneficial both of our sites, helping towards increasing both of our ranks in search engine positioning. in this online marketing campaign and I will send you additional details. This is really amazing !! Now we can play pacman in iphone.